The Daihatsu Mira has travelled 555.6 km (345 mi) on a single charge of their converted 240V Sanyo battery pack. That easily breaks the 501 km (313 mi) record set by Simmon Hackett and Emilis Prelgauskas driving a Tesla Roadster across Australia this past October. The route included hilly terrain and dense Japanese traffic. However, the Mira also included 74kWh of batteries, a 21 more than the 53kWhs standard on the Tesla. 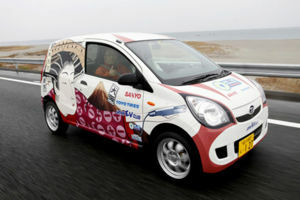 The Japan Electric Vehicle Club adapted the Mira to electric drive using a 14kW (nominal) brushless DC motor connected to the van's 5-speed manual transmission. No information is available on the type of battery pack. Toyo Tires donated the car's Eco Walker low rolling resistance tires. The unofficial distance record for an electric vehicle was set in March 1995 by Jim Worden driving a prototype Solectria Sunrise a record 601 km (377 miles) from Boston to New York on I-95 using less than 30kWh of energy on prototype NiMH batteries supplied by GM-Ovonics. The Solectria was a family-sized sedan just slightly smaller than the Ford Taurus, then the most popular car of its day. These efforts demonstrate that electric cars can travel distances comparable to many internal combustion engine vehicles and do so on a fraction of the energy and with zero tailpipe emissions. This page was last modified 02:43, 20 December 2009.